Old sash windows are installed in approximately 40 million houses, and in many cases, they don’t work as needed. The problems come from rotten wood, rusty pulleys, broken cords. It is difficult to open and close the window, or it creaks horribly. You have drainage or condensate in your home because of it. House owners install new windows instead of sash window renovation. But if you want to preserve the style of your house and save money – ask sash window specialist for help. It is possible to restore wood, install new metal or rubber parts or lubricate the old ones, and make your house look like new. Removing of sashes from the frame. After that, we see the whole picture and the amount of work. After removing of old glass we scrap away the putty, layers of old paint are also sanded back to bare timber, so we can see if the wood is rotten and how massive is damage. Cleaning of all the rusty joints or installing of the new ones, removing rot from the wood and replacing damaged parts with new resilient timber, resin and flexible fillers where needed for window sash repair. To fill gaps and fractures epoxy resin is used – no moisture and fungus will get into the timber. Priming of the frame. The initial cower protect the material from water and temperature, and the paint stays on the surface longer. Spray painting. In sash window refurbishment this method helps to make old windows look almost like new, with their elegance and chick. One spray cover is equivalent to 7-9 layers of paint applied by brush. The ready finish will be perfectly smooth. New glass installation instead of the old or broken elements. It is possible to install double-glaze units if old sash windows are deep enough for this type of glass. New hardware installation, placing of chains or cords, rebalancing of pulleys. As soon as all the elements are applied and checked, window sash repair is almost done. We put the window on its place. 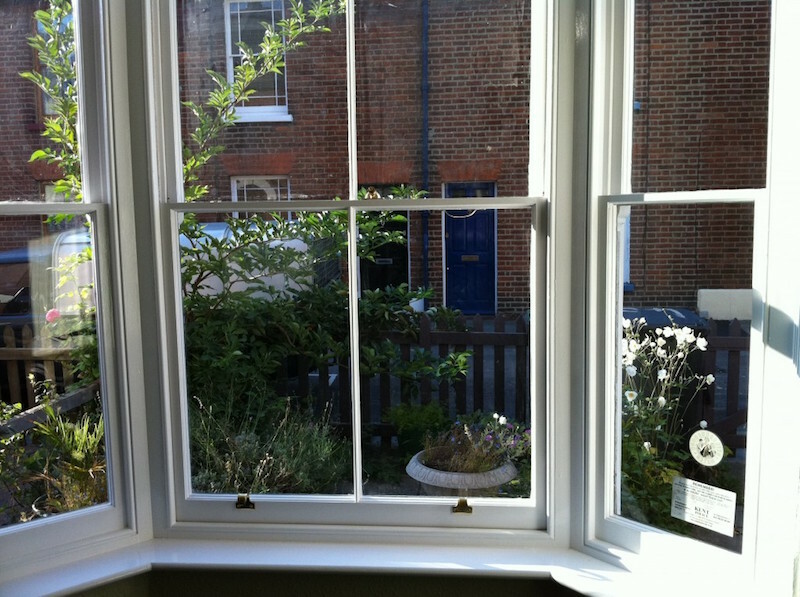 Renovating of sash windows usually takes 1-2 days. We make everything on site, so you will not have to spend several days without windows. You will have a possibility to close them at night as well – we will not live you unprotected. Thanks to the unique sash window renovation technology your windows are protected for many years. The repaired material will not crack in a year, spoiling all the effect and leaving the timber vulnerable for the atmosphere. The functionality and appearance are preserved for period from 3 to 9 years. If you want to save the original look of your house – sash window refurbishment is an answer. After the repairs, windows will look almost new, and time of their lifespan will increase. Call us for a quote – our sash window specialist will answer your questions.